Kids Town Preschool at VIPS is a nationally recognized and AdvancED accredited preschool that supports and encourages the mission of preparing children with visual impairments to function as closely as possible to their same-age peers in a typical preschool environment. At Kids Town Preschool, your child will be prepared for successful academic and social integration. Our students are exposed to a variety of medium formats (print, auditory, braille) to help each them be successful in a developmentally appropriate learning environment. The children attending Kids Town Preschool find themselves in specialized settings where the development of specific vision-related skills is embedded into their daily preschool activities. The lead classroom teachers in Kids Town Preschool are certified teachers. They hold IECE certifications as Interdisciplinary Early Childhood Educators; the teachers of the 3 to 4-year-old classrooms are dually certified as Teachers of the Visually Impaired. Each classroom is also supported by two assistant teachers. 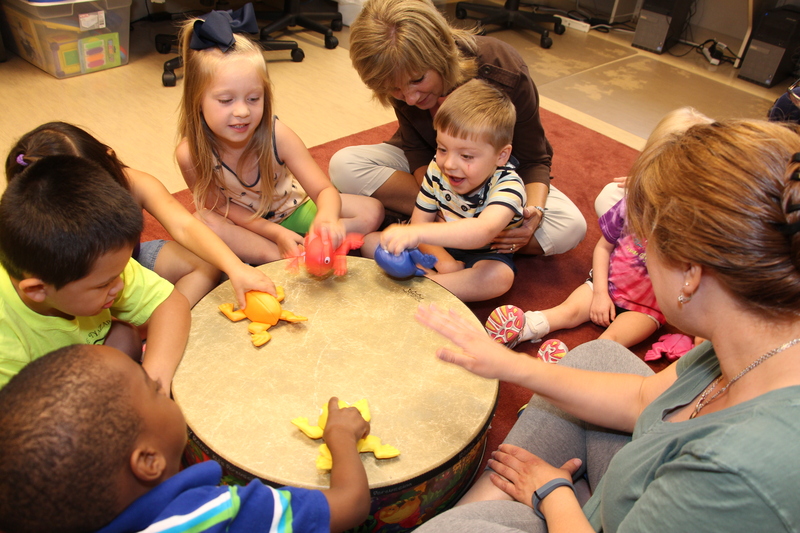 Students in Kids Town Preschool are also supported by a Certified Orientation and Mobility Specialist, a Music Therapist, and a consulting Occupational Therapist. Our Kids Town Preschool staff members understand that play is a child’s work. Through play, your child will learn about themselves, other people, and his/her environment. Your child will develop cognitive, problem-solving, and social skills as well as gain confidence and independence. As educators, Kids Town Preschool staff members are always working toward the goal of enabling each individual child to reach his/her maximum potential by recognizing the importance of providing experiences in each of the developmental domains: social/emotional development, motor development, cognitive development, language development, and adaptive/self-help skill development. Kids Town Preschool opens its doors to other children in the community. Sighted peers give the students with visual impairments experience in an inclusive instructional program from the beginning of their educational career. They are the “eyes” for our students with visual impairments during classroom activities and guides for our teachers striving for a developmentally appropriate experience for all students. Our sighted peers support our students’ development of self-advocacy skills. Research continues to support this model for optimal learning for young children with and without special needs. The teachers at Kids Town Preschool at VIPS center their curriculum on the Kentucky Early Childhood Standards developed by the Kentucky Department of Education. The standards address all areas of development and include appropriate goals for infants, toddlers and preschoolers to ensure the child’s readiness for kindergarten at age five. The preschool curriculum at Kids Town Preschool is supported by the Expanded Core Curriculum (ECC). The ECC is an expanded list of skills, which need to be addressed when educating a student who is blind or visually impaired. These additional skills will lead our students to greater levels of independence, self-advocacy, personal care, and recreation and leisure activities, to name but a few areas addressed. Tuition rates are available upon request. No child or family will be denied services based on income. Transportation is provided by contracting public school systems for students with visual impairments. We provide early intervention services for all of Kentucky and Indiana! VIPS provides early intervention services to Kentucky and Indiana's youngest children with blindness and low vision. Services include evaluations, in-home visits, and access to resources that help parents and caregivers better understand and support their child with visual impairment. Contact us to learn more about how you can take advantage of the many programs and services that are offered throughout the year. Would you like to speak with someone directly? Give us a call at (888) 636-8477. Contact the VIPS office for more information!